I'm so happy that we are wrapping up the month of March! Although it was a great month for doing dirty work on the farm. And luckily we have a few tractors to help make the job easier. This is our little John Deere 420. We've had it way before we moved to Tennessee. It is a little work horse with lots of frustrating things that drive Eldon crazy, but it sure digs in and does the job. Eldon bought a Rototiller attachment for it and it sure made quick work of tilling up some ground where I plan to plant my pumpkins and melons. Then we've got the big John Deere 5520 that is the real work horse. We bought this tractor after we moved here. It is the tractor Eldon uses all summer with the big mower attachment. In the winter it is our hay hauler. See that scary looking spear on the back? ...we have the big one to pull it out! We also use the little one in the woods for clearing and cleaning. Good thing we have a son in law that loves to help us! And this is our big ole John Deere 3100 backhoe. We brought this one with us from Utah. Our son had a little excavation business when he was in high school and this was his baby! And that is the story of Eldon's best friends on the farm. One or another of them are used on a daily basis. Can you tell we like John Deere? I have a John Deere also. But that's for another post, another day. A few of our precious little calves. They are loving the spring sunshine. April is almost here, my friends! Oh happy day! One early morning last week I arrived at a friends house and she had the yummiest scone and coffee ready for me when I drove up. Since then I've been craving scones! She had made a yummy Oatmeal Maple Scone (The Pioneer Woman recipe) which I promptly made the next day! Then today I was cleaning out my freezer and came across the last little bag of blueberries that my daughter and I picked last summer. All I could think of were Blueberry Scones! I've had this recipe tucked away for a day just like today! We oftentimes have dessert with our daughter and her little family on Wednesday night. So that was a great excuse to make them! Of course the first thing I did when they came out of the oven was fix myself a cup of coffee and have a warm scone! I was thinking as I was making these that it won't be long (thankfully) and we'll be in fresh blueberry season again. I can't wait to be out in the blueberry field dripping in sweat from the humidity and swatting the mosquitos! (Can you tell I'm super tired of the cold weather?!) But strawberry season comes first and oh, is it ever so fun to pick fresh strawberries. And I'm thinking home made strawberry ice cream is the first thing I'm going to make! How about you - what is your favorite fresh summer fruit to pick and what will you make first? In the mean time, buy some blueberries - or dig them out of your freezer like I did - and make these yummy scones! Preheat oven to 400 degrees. Place a baking mat on a cookie sheet and set aside. Sift together flour, sugar, baking powder, and salt. Using a pastry cutter, cut in butter until it is the size of small peas. Stir in blueberries and zest. Using a fork, whisk together eggs and milk, set aside. Make a well in the center of dried ingredients and pour cream inside. Using a large spoon, lightly stir dough just until dough comes together. Pour dough out onto floured surface and press into a 6 inch square. Cut into four 3-inch squares and then cut each square on the diagonal to form 8 triangles. Brush each with cream and sprinkle with sugar. Bake 20 minutes until golden brown and transfer to wire rack. Mix together to desired consistency (adding milk if necessary). So what do you do when you get spring fever but it's not quite warm enough to do much on the farm? You join the masses and go to a good ole Tennessee Auction! Before moving to the South I had never experienced anything like this before. It is sort of hard to explain the number of people (mostly men!) that come from all corners of the County to look at the farm equipment for sale! Unfortunately, I saw a lot of things I wanted. This is an old John Deere manure spreader, still in working condition. I wanted it for the wood! And the rusty parts. Tractors don't interest me, but Eldon and our son in law were sure in tractor heaven. See? They just stood there with smiles on their faces! Oh the junk, the wonderful, amazing old junk! I loved this old farm wagon. We actually bid on it. But so did a whole lot of other farmers! These precious grand girls of mine were the sweetest things at the auction of course! They loved listening to the Auctioneer and mimicking him! This was the other thing I really, really wanted. It was an old antique seed cleaner. All I saw was the awesome wood and how I'd like to dismantle it and hang the wood in my house! Or make planters out of them for flower boxes. We didn't manage to get these either. Let the bidding begin! The little girls had the best vantage point and could see over everyone's heads. So we left without buying anything. But it was the best day - a perfect family outing with our kids and grand-girls! So, the news on the farm is that Eldon was gone for over a month consulting at his old job. Justus, our son-in-law, helped me take care of things on the farm while Eldon was gone. We are all back to normal now with him home and eager to get started on some spring and summer projects. Dare I mention building? Yes, we are going to be building again. This time Eldon's garage and shop. I don't know whether to be excited or not! I'm anxious to get my spring garden planted - mainly just peas and lettuce. What are you planting in your spring garden? Have a lovely weekend - it is supposed to be warm here! My love for Red Velvet Cake began many, many years before I moved to the South, where it is probably the most popular cake of all time. I grew up in New Mexico where my mother made Red Velvet Cake for special occasions only. It was my very favorite cake so I asked for it every single year for my birthday. And I got it! Probably the most special memory I have of it though, was that I had it made for my wedding. To this day, I never make a Red Velvet Cake without thinking of all the special memories attached. I use the old original recipe that was given to my mother about 60 years ago. In the current issue of Where Women Cook, the Editor talks about food traditions. 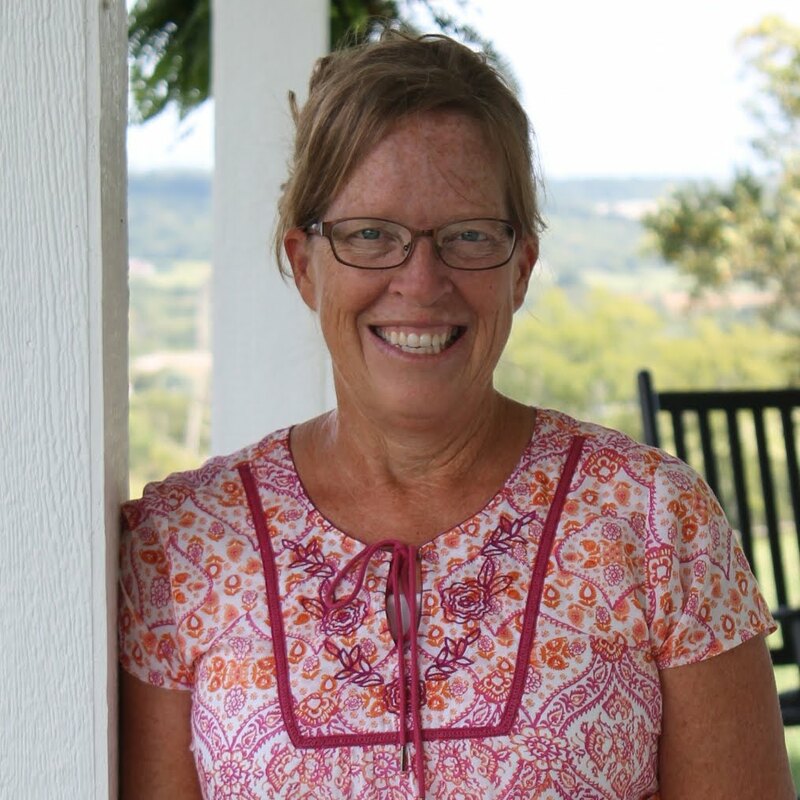 She asks this question: "When you close your eyes, which of your much-loved traditions come to mind and which dishes were made year after year that were an important part of the celebration"? I did it. I closed my eyes and immediately, and I do mean immediately, Red Velvet Cake came to my mind! So, I'm pretty sure this cake tastes incredible, looks incredible, IS incredible partly because, for me, it is absolutely and totally chock full of special memories! I'm going to share my mother's very old and very treasured recipe with you. Follow it exactly! And then let me know what you think! Preheat oven to 350 degrees. Grease and flour two 8 or 9 inch round cake pans. Cream butter and sugar in mixer bowl until fluffy. Add eggs and beat well. Place cocoa and food coloring in small bowl and stir to a nice smooth consistency. Add flour mixture alternately with buttermilk, beating in between each addition. Add vanilla, vinegar, and baking soda. Mix well. Pour evenly into prepared cake pans and bake until done, about 25 minutes. Remove from oven and let cake rest for about 5 minutes then remove from pans. Combine milk and flour in a small saucepan. Cook, over medium heat, stirring constantly until smooth and thick. Remove from heat, pour the mixture into a clean bowl and cover the surface with saran wrap. This stops the cooking and also prevents a skin from forming on the surface. Set aside to cool. In stand mixer cream butter and sugar until fluffy. Add vanilla and mix. When your milk mixture is slightly cooled, add one tablespoon at a time to the butter mixture, whipping thoroughly in between. Whip until you have a fluffy, white and buttery frosting. Frost each layer with small bit of frosting and then frost the entire cake! Refrigerate to solidify the frosting and it tastes better cold! So, now a little discussion on the frosting. When I've shared this recipe in the past, I've actually heard folks say, "I didn't use the frosting recipe because I read the recipe and it seemed incorrect". It does seem very, very strange to make a roux for a cake frosting! However, I beg of you to please, please do not use any other frosting in the Red Velvet Cake. It is what actually "takes the cake"! This is what I know about the frosting. It is a very old recipe that the French used to call Boiled Milk Frosting and then later it was called Ermine Frosting. It uses the gluten in the flour and the casein in the milk to create a suspension that makes for the fluffy amazingness of it! It is a little extra work, but I really like that it is the very old original Red Velvet Cake frosting. When you close your eyes, which of your much-loved traditions come to mind and which dishes were made year after year that were an important part of the celebration? We have finally felt the beginning of Spring on the Hilltop! For a couple weeks now, I've been settling in my comfy chair at night with my Baker Creek Heirloom Seeds catalog and my garden journal, so it was fun to finally get down to business and order my seeds! Do you get this catalog? You can look at all their products online of course. But personally, I LOVE having the catalog in hand so I can stare and stare at all the pictures of gorgeous, rare, and exotic flowers and vegetables. I love that the seeds are all heirloom, most of them very, very old. They also certify their seeds as non GMO, which I love. My catalog is scribbled and dog eared. I ordered watermelon seeds this year. 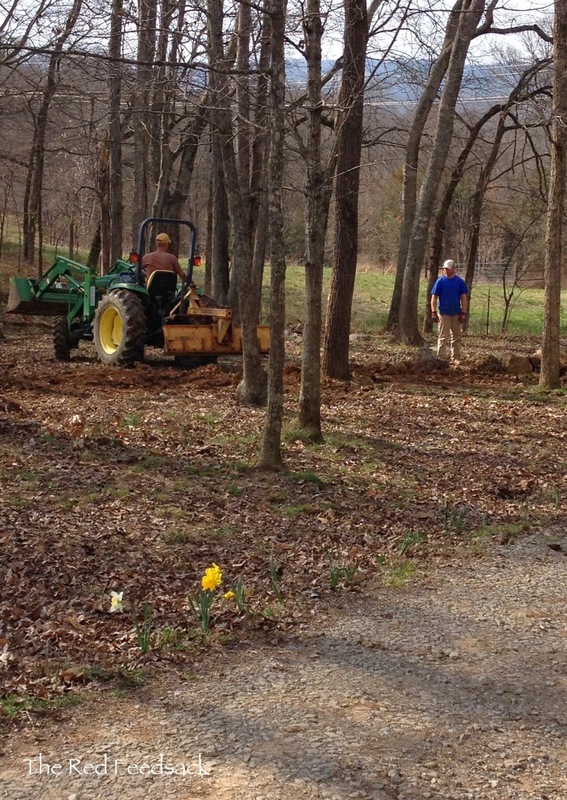 Eldon is plowing up part of our orchard area for me to use for the big things like watermelon, cantaloupe and pumpkins. I just don't have room for those plants in my garden plot. I'm actually so excited for my garden this year. It seems like this winter was such a long one! My daughter and I have been sitting here doing a lot of plotting, thinking, planning and looking at pictures on Pinterest. We've got plans for a little market business that we will share with you in the days ahead! So now. On to an entirely different subject that has nothing to do with Spring. Well, maybe it does. Spring in Alaska! 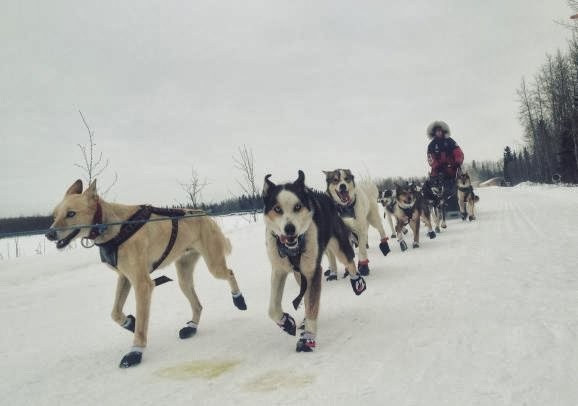 How many of you have been following the Iditarod Dog Sled Race in Alaska? Maybe it is because my husband is from Alaska and still has family there, but we try to follow it on the news every year. Or maybe because it is one of the most phenomenal sporting events ever. It's said that it is the "Last Great Race on Earth". 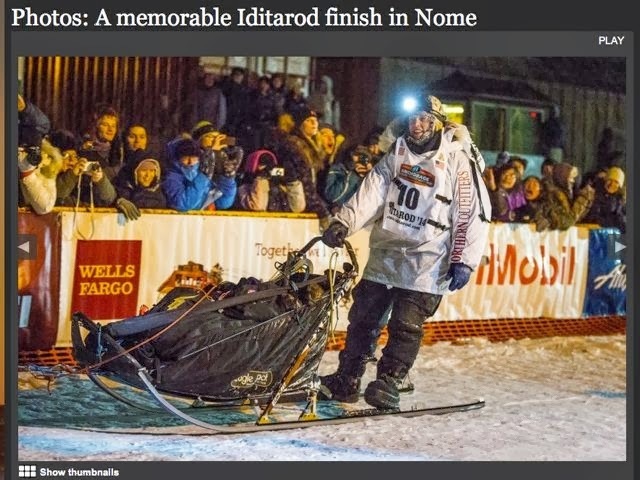 Here are a few other links to read about the Iditarod and the final finish of the first two Mushers. Strange end to a blog post about Spring on the Hilltop.... but I guess that is the advantage of being a Blogger! We get to share what is on our minds! I've been wanting so badly to get outside and clean our porches and get them ready for spring. But, unfortunately there haven't been very many days that were warm enough to do much outside! So, instead I decided to make a new wreath for my door! I chose to make an extremely simple one with a straw wreath and some burlap garland. Both were very inexpensive at Walmart. After gluing down the edge, I just started wrapping the wreath with the garland, pulling it tight as I went. When it was completely covered, I cut the burlap and glued the edge down onto the back. Very simple! Now you can choose to garnish your wreath any way that you would like. I decided to start with some old vintage buttons I have. I stuck with a monochromatic color palette (I know, that is very strange for me!). But I had made wreaths for both of my daughter's and I really like the black/brown/grey/white look. And maybe I chose those buttons because in my can of vintage buttons those are mostly the colors that are there! I didn't really use any rhyme or reason on where I put the buttons. But I did just adhere them to one half of the wreath, as I had plans for the other half. Just one little dab of hot glue is all it takes to stick them on. I then made four burlap roses. I would go through the step by step tutorial on them but I found the idea on another blog and her tutorial was so great there is no sense in me trying to do it better. You can find that here. In order to get the roses to really fit on the wreath the way I wanted, I used my scissors to poke a deep hole into the burlap and through the straw wreath. I then filled that hole with hot glue and stuck my rose stem right in the hole and held it tightly until it stuck. The roses were really fun to make and as a matter of fact, while I was working on these I made a few more out of some vintage patriotic fabric so that I can put them on another wreath in the summer. They are a little addicting to make and once you get started you can't quit! I stepped outside into the freezing cold and hung it on my door, snapped some pictures and it wasn't until I uploaded them onto my computer that I saw I had gotten a few Momma cows and a new baby in the reflection of the glass door! It's a common sight from our porch. There you have it. A very simple burlap wreath. I hope your March is off to a great start. We had a lovely day here on the farm yesterday with fellowship, friends and yummy food! 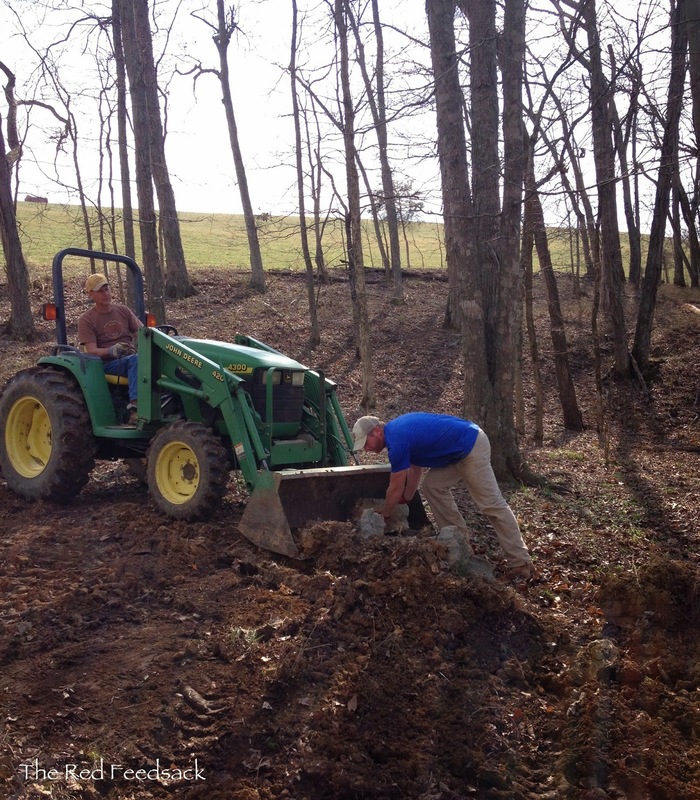 And now we are really hoping for some nice spring weather as Eldon is gearing up to begin work on his barn!